While it remains a debate as to whether breakfast is the most important meal of the day, I do find it vital to start off every day with a good, healthy meal. This is especially so after becoming a mum and I can earnestly say that for the past six years, I've been trying my best to inculcate the habit of eating breakfast within the family. However, with three kids who wake up at different times of the day, I have to admit that I usually turn to the fastest, easiest and fuss-free ways to prepare breakfast. Some time ago, I've tried to start the kids, and myself, on eating wholesome, nutritious oats but let's just say that it didn't take off too well as our breakfasts turned out to be plain, bland and just unappealing. Yes, I got it ALL wrong at that time, which was before I discovered the wonders of oats and how it actually allows you to make use of your creativity in satisfying both your needs and wants. Overnight oats, cookies, cheesecake bars, smoothies, soup, parfait, instant oats served with fresh fruits - there are just countless ways to add oats to your everyday life. 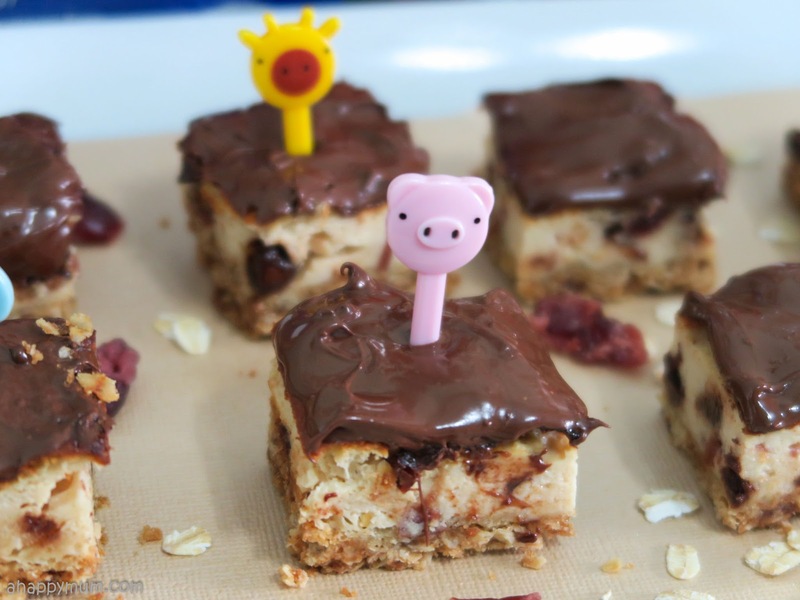 Plus, it can be not just nutritious but tasty as well, which is perfect for the little ones. Today, I share with you our favourite recipes and how we have been starting our day on a healthy note with Captain Oats. Oats have a higher concentration of protein than other cereals and are the best source of plant based protein. Oats are the only cereal to contain a legume like protein or globulin known as avenalin and can help increase stamina and energy. Oats contain beta glucans - a rich source of dietary soluble fibre, that absorbs cholesterol in the small intestines - and helps to lower blood cholesterol. Oats contain high amounts of Vitamin B1, B2 and E, and essential minerals such as phosphorus, zinc, manganese and folic acid. Eating oats regularly can help to lower the risk of diabetes, guard against cancer, boost the body’s immune system and prevent heart disease. Raw oats are not good to eat, therefore they have to go through certain processes to make them more appetizing. The various stages include cleaning, dehulling, heating, sizing, cutting, flaking and lastly, packing. Using quality oats from Australia, Captain Oats makes use of its proprietary OatiFresh process - which helps to preserve natural nutrients, resulting in quality and refined oats filled with wholesome benefits. With a high emphasis on consumers' food safety, stringent tests are done and all oats are packed onsite to ensure maximum freshness. 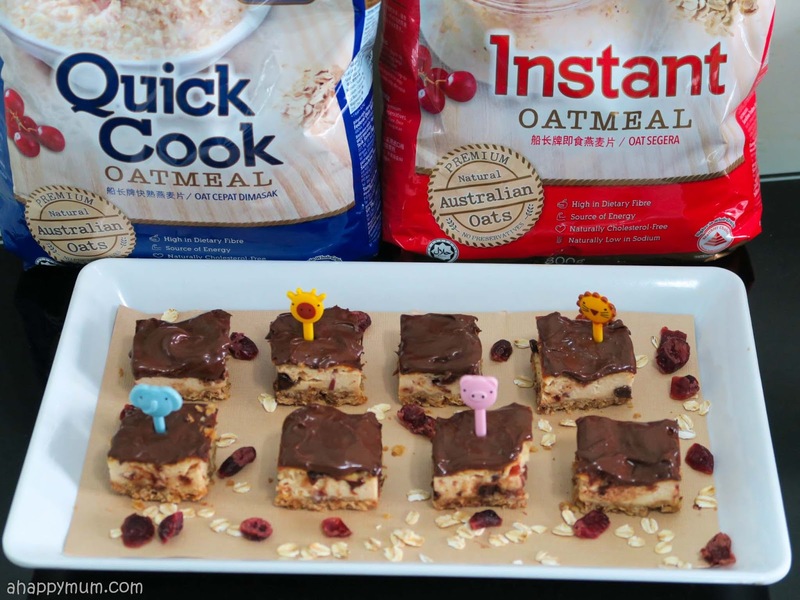 If you are like me and wonder what the differences are between rolled, quick cook and instant oats, here is a quick summary. 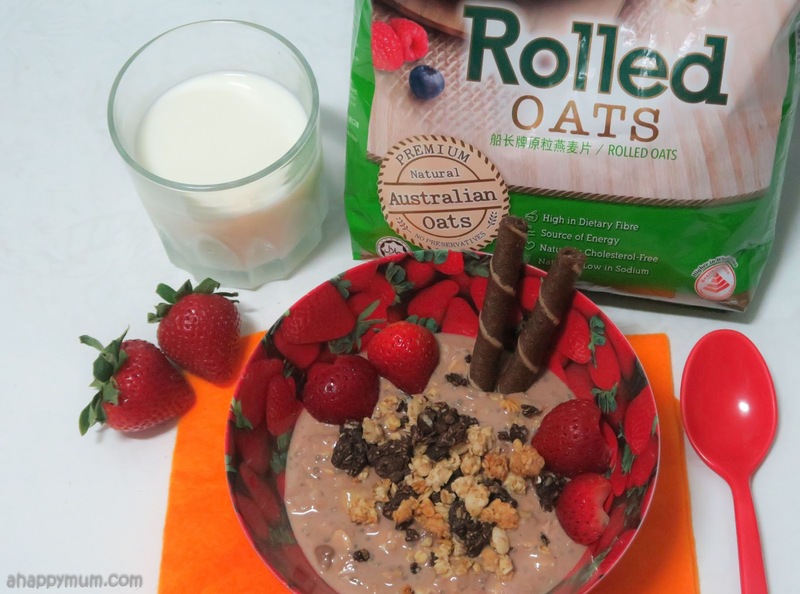 Rolled oats - Oat groats that have been de-husked, steamed and then rolled into flat flakes under heavy rollers. Has a nice, chewy texture. Takes about 8 minutes to cook. 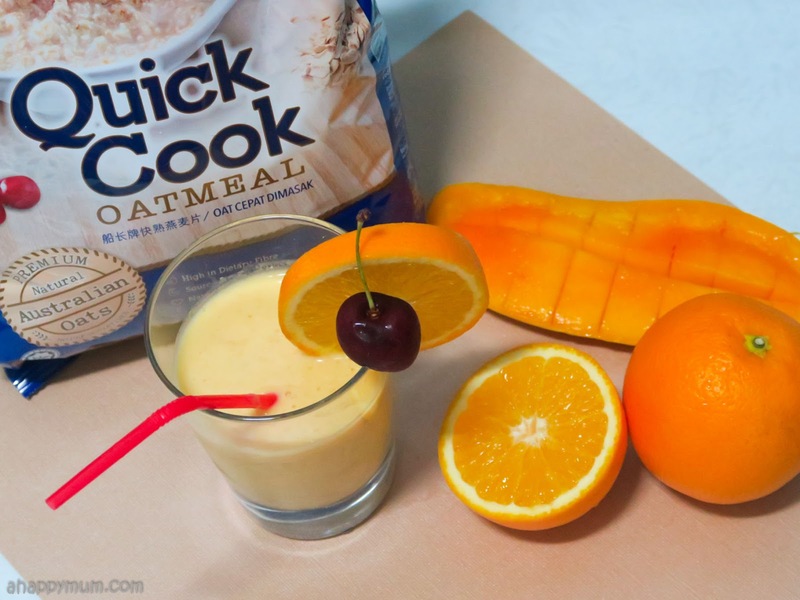 Quick cook oatmeal - Rolled oats that have been coarsely chopped. Has a slightly finer texture. Takes about 3-5 minutes to cook. 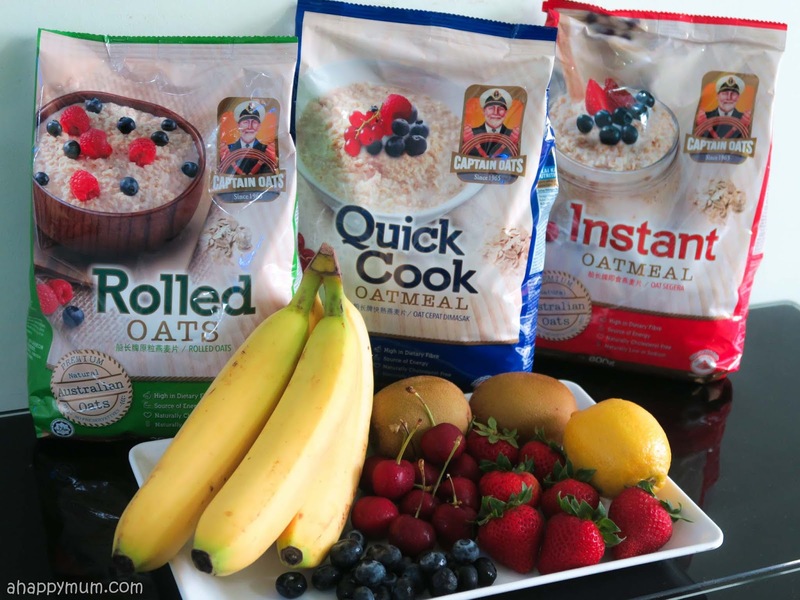 Instant oatmeal - Rolled oats that are cut fine and rolled extremely thinly. Has a mushy texture. No cooking required, just add boiling water. So it all depends on what you are cooking, and how much time you have to spare, when deciding on which type to use. One thing to note is that unlike some grains which go through intensive processing, oats are always whole - meaning it keeps bran, germ and endosperm intact, regardless of whether they are steel cut, rolled, quick cook or instant. The first recipe I am going to share is one of my favourites simply because it is so easy to make - overnight oats! I never knew that oats can taste so nice when soaked overnight, after absorbing the liquid that you put in. Best of all, you don't need to to cook and once the base is done, you just need to serve the next morning and add in any topping of your choice. 1. Whisk all the ingredients together in a bowl. Spoon into a jar with a tight fitting lid. 2. Refrigerate overnight, or at least for 4 hours. 3. Serve and top with granola, fruits, wafer rolls or anything you desire. 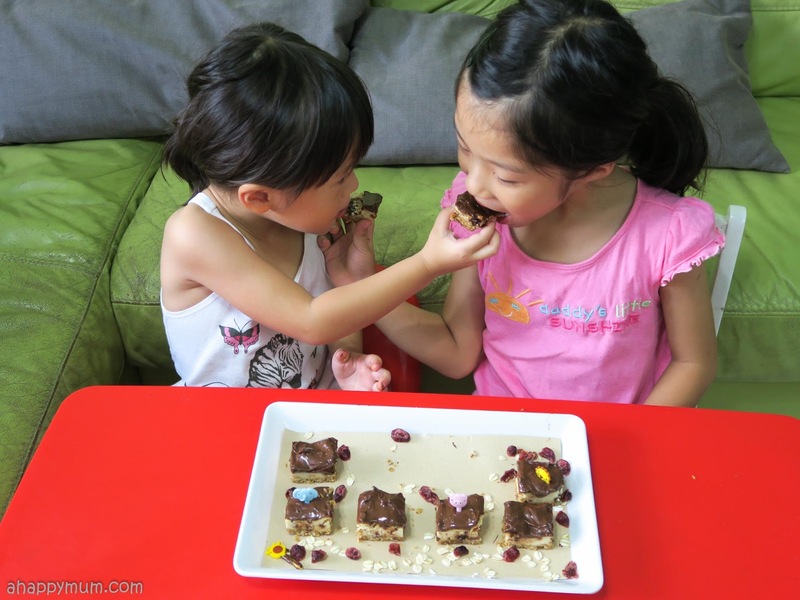 I know, chocolate flavoured food is not the best stuff for kids, but considering that mine are such chocolate lovers, this is my strategy in getting them to first fall in love with eating oats. Once they realise that oats are not as boring as they think, we will slowly work out the flavours from there. Even if you were to add in some sweetener into your oats, which you probably need to unless you really like it plain, I think the fact that oats are so wholesome and nutritious helps to justify it. What I love about this: You can get many different textures in every bite and add in any of your favourite toppings. It's also easy to heat up if you prefer it warm. Now, when it comes to oats, you don't always have to eat it, sometime you can just drink it. I find this perfect when the weather gets too hot and we are all trying to quench our thirst. 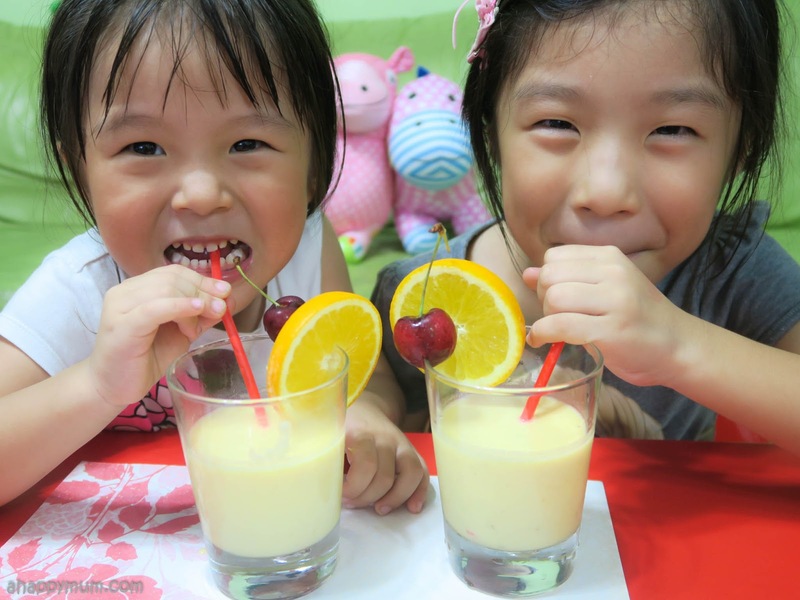 Instead of sweet drinks or just plain water, why not try out a nutritious smoothie? Blend all the ingredients, add in some ice if you desire, together in a blender until smooth. I have to say that the texture is a little thick for the kids and it ended up that the hubby and I enjoyed it more. Still, the girls did drink up a significant portion and I think it was a very convenient and easy way to get some oats into their system. I personally like mine fresh from the blender, but if you are rushed for time in the morning, you can prepare it the night before and keep it refrigerated. All you need to do when you wake up is to drink up a nutritious breakfast in just a minute or two. What I love about this: You get that nice, tangy taste that comes with the citrus zest and I find it very refreshing. Then there are those nights when you get too tired to prepare anything and unknowingly fall asleep with the kids. Yes, please tell me I'm not the only one. So, it helps to have on standby some instant oatmeal because all you have to do is to add some boiling water to it, stir it well, add in some toppings and drizzle any sauce you like. 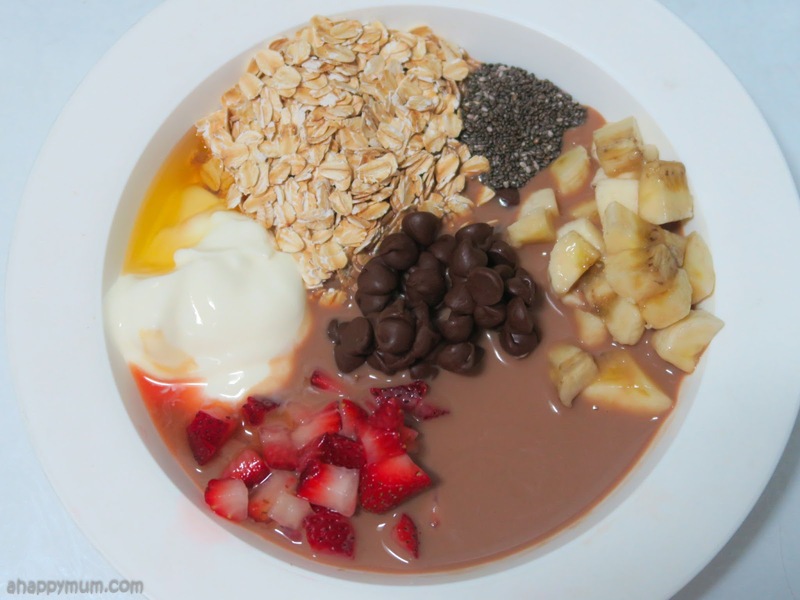 Couple it with a glass of fresh milk and you have just prepared a healthy breakfast in under three minutes. Instructions: Add one cup of boiling water to one packet of Captain® Instant Oatmeal. Top with any fruits of your choice and drizzle some maple syrup. With a baby who is turning seven months old, I've also tried letting him have a taste of oats after reading that he is ready to do so by this age. To make the texture more fine and consistent so that it is easier for the baby to swallow, you just need to blend the oatmeal for a few seconds. Best of all, you don't need to sweeten it at all and can just add in some fruit purée. 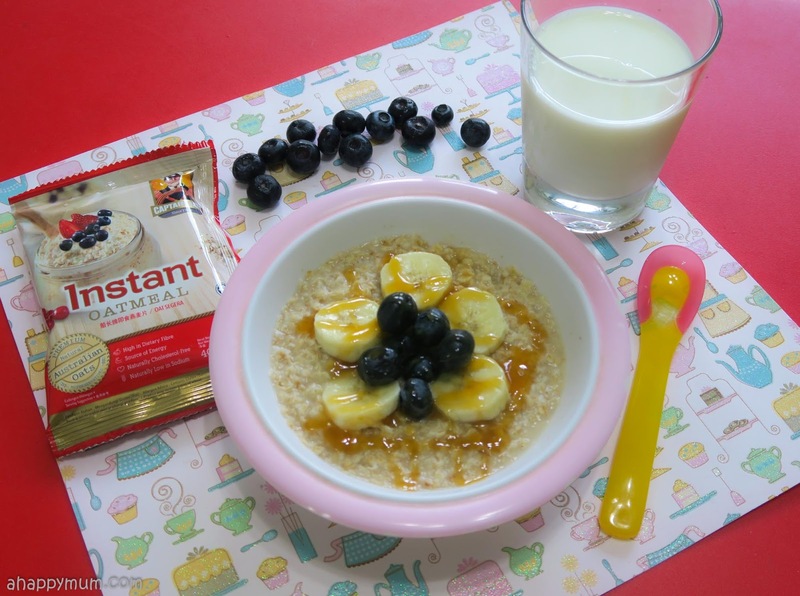 What I love about this: It is a quick and almost effortless way to cook up an instant oatmeal that is at the same time nutritious for the little ones. Coming to the last recipe, this was certainly a big hit with everyone in the house! When I first came across the possibility of eating oats in this way, I knew I had to try it out by hook or by crook. Am I a good baker? No, not by a long shot. But can I bake? I guess so. So, considering how I have a love for cheesecakes, I totally couldn't resist trying to make my very own cheesecake bars - that come with oats! 2. Mix (A) in a bowl until well-combined. 3. Line a baking pan with baking paper. 4. Press the oat mixture onto the bottom of the pan firmly and set aside. 5. Mix cream cheese and sugar until smooth and creamy at low speed. 6. Add egg and vanilla into the mixture. 8. Next, add in dried cranberries and chocolate chips. 9. Pour the cheesecake batter over the oat crust. Bake for 40 minutes. 10. Allow the cheesecake to cool at room temperature. Refrigerate for at least 2 hours before removing and cut into cubes. 1. Melt cooking chocolate with a hot water bath. 2. Dip the top of the cheesecake cubes into the melted chocolate. Believe it, we couldn't stop taking one bite after another. Yes I know, the chocolate was a huge draw but at least the kids ate all the oats that were in there too, and even asked for more. I was certainly doing a victory dance when that happened and to top it off, the hubby who is a non-cake lover came back, tried it and surprisingly said "This is quite yummy!" Yippee! What I love about this: The crunchiness of the oats and soft cheesecake form a great combination for the palate. This can be served as a snack at any time of the day and makes a great dessert for parties too. So, I said at the beginning that eating oats allows you to make use of your creativity and I hope you can see what I mean now. I got it wrong previously but now I see the benefits, ease and room for originality whenever I experiment something new with this wholesome cereal. I'm definitely going to explore more interesting recipes and try to instill eating oats as one of the things my kids will look forward to. 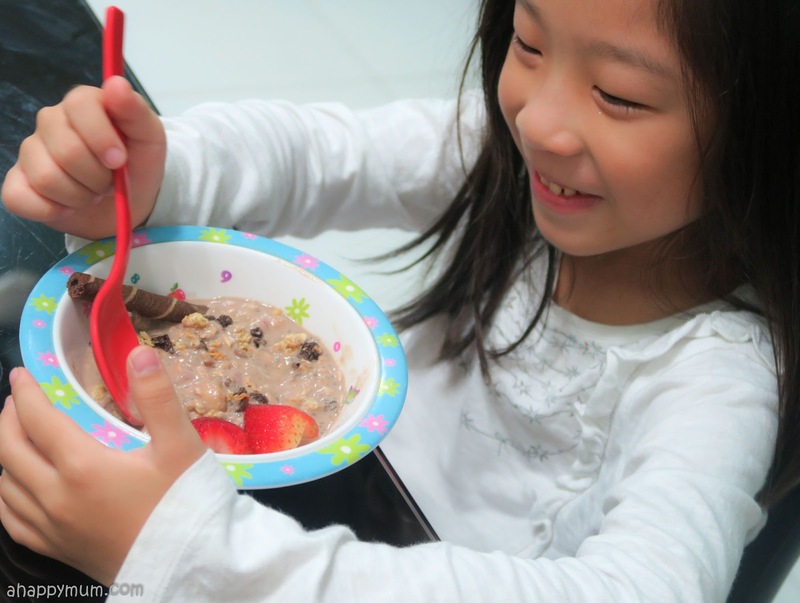 For more kid-friendly oat recipes, head over to Life's Tiny Miracles! Disclosure: This is a sponsored collaboration between Captain Oats and A Happy Mum. All pictures and opinions are my own.